Honey has long been recognised as a natural remedy and has been used as a medicine for thousands of years. Beeswax and honey have been found in the ancient tombs of the Egyptian Pharaohs. Apiculture, the practice of beekeeping to produce honey, dates back to at least 700 BC. Alf and Anna Brugman have been keeping bees for 30 years. People who get into bees become virtually obsessed with them. Alf says there is always something more to learn and that you never really become a master  even though you might think you have. For example, people used to think that all the bees in the hive were the progeny of the queen and one drone. Quite recently, it has been discovered that the queen is fertilised by four or five drones, and that explains why you find bees of many colours in the hives. Another discovery is that bees are quite selective about which flower they will fly to. They definitely choose one flower over another. They might pass over a flower with nectar 100 metres away and fly 500 metres to find the flower with better quality nectar. Other than being a favourite food, honey has a range of medicinal qualities. One of Alfs customers told him that by eating honey that included the pollen of the types of flowers that gave her hay fever, her symptoms decreased. Not scientifically proven yet but definitely worth a try if spring, for you, means getting quickly to the supermarket to stock up on your tissues. Honey is a traditional remedy for sore throats and also relieves the symptoms of colds, particularly if mixed with lemon and hot water. It is also now used by many hospitals in the treatment of burns and wounds, especially those that are slow healing. Like most beekeepers, Alf is likely to treat a bee sting by dabbing it with a bit of the golden drop. For all these purposes, and for consumption as well, organic honey is the best. Alf is a certified organic apiarist, meaning that his hives are kept well away from genetically modified crops, and that there must be a five kilometre radius around the hives which is free of sprayed crops. 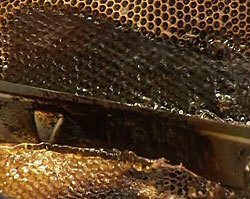 But according to Alf what makes organic honey the best is that the honey is cold extracted from the hives. Most manufactured honey is runny, unlike natural honey which will crystallise after some time. Runny honey is heated during the extraction process, which stops it from crystallising but also destroys the enzymes and pollen in the honey, making the product lower in protein. Organic honey is kept at its natural cool temperature during extraction and retains all of its beneficial properties. 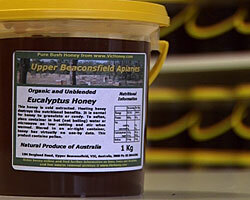 And it may even taste like Alfs favourite long leaf box organic honey  absolutely perfect! Did you know that supermarket foods contain very strong chemicals that can be seriously unhealthy for your body? Over time these chemicals build up and can leave you feeling constantly tired, give you stomach cramps and leave you in a depressed state. 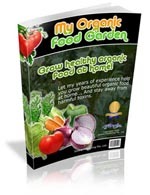 Learn WHY you need to eliminate these toxins from your body and HOW to do this with 100% organic foods!